KATIE COURIC, "Evening News" anchor: With all the attention on Hillary Clinton this election year, it's easy to forget that there was another Hillary who once captured the world's attention, Sir Edmund Hillary, the first to conquer the world's tallest mountain, Mt. Everest, in the Himalayas. COURIC: He died early Friday in New Zealand. He was 88. COURIC: Like that other Hillary, Sir Edmund set out to make history. He wanted to scale a peak most people thought impossible. Scores had died trying to climb Everest. The dangers were extraordinary. Howling 100 mile-an-hour winds, perpetual cold and air so thin you need an oxygen tank. But Sir Edmund with his sherpa guide Tenzeng Norgay defied the odds and the experts and went where no one had gone before, literally to the top of the world, 29,035 feet above sea level on May 29, 1953. COURIC: That achievement should be an inspiration to anyone seeking to climb any mountain in life, no matter how daunting. 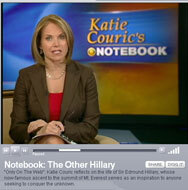 That's a page from my notebook, I'm Katie Couric, CBS News.